Army enlisted jobs are called military occupational specialties, or MOS. The Army divides its MOS into fields of jobs that have similar missions. Below are some of the jobs that belong to the Air Defense field. As part of the Patriot missile team, MOS 14E has specific technical duties that are part of launching the missile system, including initializing and operating the Patriot's information and coordination center, its engagement control station, its radar set, and the antenna mast group. Part of the job involves maintaining and conducting preventive checks on the Patriot's fire control section and related equipment. To be eligible for this job, you'll need a secret security clearance, which will require a background check. You'll also need a score of at least 104 on the mechanical maintenance segment of the Armed Services Vocational Aptitude Battery (ASVAB) test. 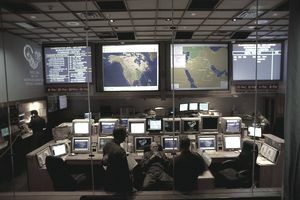 The air defense battle management system operator is in charge of equipment systems that defend against aerial and space attacks. These soldiers are in combat situations frequently, so remaining calm under pressure is an important personality trait. Like most of the jobs in this field, you'll need a secret security clearance. A score of 99 on the MM segment and a 98 in the general technical (GT) segment of the ASVAB also is required to qualify for this MOS. Soldiers who are in MOS 14J track both friendly and enemy aircraft, and provide early warning information when appropriate. They're responsible for doing maintenance and repairs on tanks and other Army vehicles and are called upon to manage a variety of intelligence duties, which vary by mission. To be eligible for this job, you'll need at least a 99 in the mechanical maintenance (MM) aptitude area and a 98 in the general technical (GT) aptitude area on the ASVAB. For this Army job, you'll learn how to handle ammunition, how to calculate enemy target locations and artillery tactics. This is a job conducted under combat conditions a large percentage of the time, so being able to focus under stressful situations is necessary. In addition to a confidential security clearance, you'll need an 85 in the operators and food (OF) segment of the ASVAB. Another member of the crew that services the sophisticated Patriot missile system, these soldiers operate the 10-ton crane that moves the missile and its launcher. They're also responsible for doing safety checks and maintenance on the missile's many parts. But this isn't a grease monkey job; these soldiers are responsible for loading and reloading Patriot missiles in combat situations, frequently under enemy fire. It's up to them to prepare situation reports and issue warnings and help with reconnaissance and mapping to select the best position for launch. This job requires a confidential security clearance, since you're overseeing and handling technical weapons systems and have knowledge of field positions during combat. To qualify for this position on the Patriot missile team, you'll need at least a 92 on the OF segment of the ASVAB. And since you'll be handling advanced, highly technical weapons systems, in order to qualify for MOS 14T, you'll need a confidential security clearance.